It's hard to remember, but yes, some stress really is ok. The basis of stress is a protection mechanism (thus the term "fight or flight"), which starts with a burst of adrenaline. Next comes increased levels of cortisol that helps us perform by circulating blood from the digestive tract to where it's needed in muscles and for raising blood sugar levels, which can boost energy. 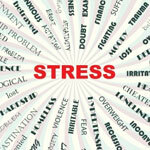 The moment you get stressed, you experience a physical stress reaction; you know, a faster heartbeat or tense muscles. You might also feel heightened emotions, such as anger, blame, or judgment. Your body usually reacts to stress in the same way each time it strikes, so noticing how you tend to react, how often you experience these symptoms, and if they become more serious is the first step toward regaining calm. From there, heed these simple steps for keeping your cool. A Acceptance. Accept stress as a daily reality and something that needs to be balanced, like your heartbeat, with relaxation. The body is equipped to address stress when it has the right tools. B Bring on balance. This concept is key to maintaining healthy stress levels. It means balance of nutrients: carbs, protein, fats; balance of good bacteria (i.e., probiotics) and bad bacteria; balance of alkalinizing and acidic nutrients for healthy pH in the digestive tract; a balance of calcium and magnesium; and a balance in your daily activities. C Create daily calm. Even when you don't feel stressed, your cells may be affected and your energy suffers. While coffee or caffeinated energy drinks offer a quick boost, they don't address the real issue and further deplete stress-reducing magnesium. Magnesium supplements can help you relax cell by cell. When you keep your calm every day, you'll have more energy for the long-haul. Overly stressed people rarely take a moment to notice their stress, which is the first step to regaining calm. Make it a habit to practice mindfulness throughout the day. Mindfulness is a receptive self-awareness that anyone can tap into by simply bringing attention into the present moment, pausing, and embracing a nonjudgmental attitude. Consistently checking in with how you feel emotionally and physically, on a moment-to-moment basis, can be a powerful anti-stressor.